Generator enclosures serve a vital purpose in ensuring the continuous operation of major facilities. In most applications, the enclosures mainly safeguard the generator itself from any damage from the outside. Things such as rain, debris, falling objects, and other external forces all can pose a threat to the generator. All facilities have two major reasons for providing an enclosure. First, they need to protect their investment. These industrial generators are a very expensive piece of equipment that these facilities have put a lot of money into; the enclosures are the best way to ensure the generator stays in pristine condition. 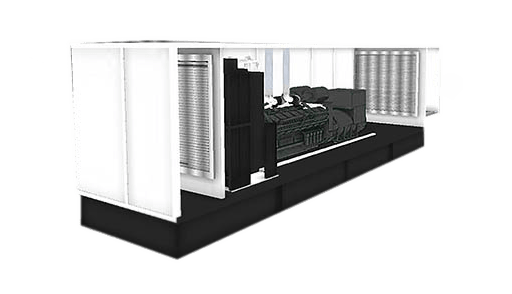 Second, and perhaps more importantly, the generator enclosure makes sure the generator stays in operational condition, so, when it is needed in an emergency situation it is 100% ready to go. 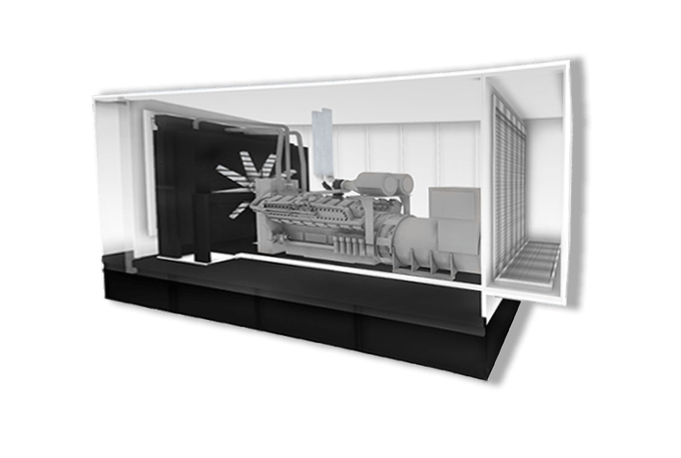 However, depending on your local and state codes and ordinances, a Generator Enclosure may be required for an entirely different reason: noise control. 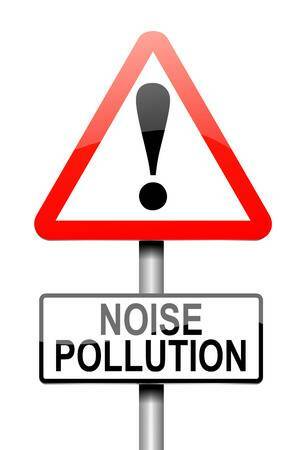 Initially, noise pollution was controlled by the federal government with the Noise Pollution and Abatement Act of 1972. However, since then, the power has been delegated to state and local bodies. So, regulations can vary from place to place. For this reason, Panel Built also manufactures generator enclosures with varying degrees of sound attenuation. Sound Attenuation is simply the reduction of noise coming from a general area. Why is Sound Attenuation Needed? Generally, public spaces have ordinances for the amount of noise that is allowed to be emitted from a facility and the level is based on the amount of sound that is emitted from the property as a whole. Learning local noise pollution code should be the first step in any exterior generator project. So, when measuring whether or not the generator/enclosure is within code, sound levels are measured from the perimeter of the property. Since each area has different ordinances and each generator type emits different levels of decibels, each generator installation has to be tested to ensure it will fit into code. Sound testing will take place at the project site. First, the ambient noise of the area is measured (the current noise level of the area) as a baseline. Then the noise level is tested again at the same location with the generator running at full load. In this case, the noise level is tested at a variety of frequencies. If the results prove to be under local ordinances, the generator will be put into use. However, ordinances are not the only reason these generators will require enclosures. Noise pollution and overall persistent high noise levels have proven to have a direct impact on people’s general health. This creates a problem for public facilities that require power at all times. Not only would this noise cause you discomfort, but could potentially damage your already diminished health as it is. Not to mention potentially distracting hospital staff while they are trying to take care of their patients. In this scenario, the hospital has more incentive to provide sound attenuation than usual as it could cause harm to patients and employees inside. For this reason, most generator enclosures that are installed in a hospital or medical facility will have some level of sound attenuation incorporated into it. How Do We Reduce the Noise? Noise from the engine, cooling fan, exhaust, and just general vibrations all contribute to the overall noise output of the engine. Sound Attenuated generator enclosures help to reduce the overall vibration and create a barrier between the generator and the outside world. The barrier forces the vibrations to slow down, reducing the noise coming through the enclosure. For Panel Built, we offer two specific levels of sound attenuation. Our Level 1 and 2 Sound Attenuated Enclosures provide an overall 15 dBA and 25 dBA reduction at 7m, respectively. In order to achieve this level, Panel Built will use a stationary louver for the intake of the air to minimize sound, protect the interior of the enclosure from picking up too much moisture from the air, and help regulate the temperature inside the enclosure. An air discharge hood is put in the back to direct the generator exhaust fumes out of the enclosure and, again, protect from the intake of moisture from outside. Depending on the level of sound attenuation needed for the enclosure, a varying amount of mineral wool will be added to the enclosure walls to meet the intended sound attenuation level. Why Not Get a Quieter Generator? Unfortunately, when it comes to noise, the diesel generators that are typically used in this application tend to be louder than their gas counterpart. But they are still consistently used over gas versions. Why would that be? While diesel generators can be more expensive in initial cost, the lifetime cost of the generator is considered to be much lower due to a few factors. First, the maintenance cost for these generators are much lower than their gas counterpart. Fewer repairs on the machine helps ensure the owners do not hit unexpected expenses further down the road. Second, revolves around the fuel itself. While diesel fuel itself is more expensive per gallon than gasoline, these generators are much more efficient in their fuel consumption. This also helps extend the overall running time a generator can operate on a single tank of gas, allowing them some additional power when an outage does occur. But perhaps the most important factor in going with a diesel engine is their reliability, diesel generators have an incredibly long lifespan and are rarely incurs any downtime. This helps make sure the facility is never caught off guard with an outage. If you have a generator enclosure project, whether weatherproof or sound attenuated, give us a call. We provide generator enclosures that have a sleek and durable aluminum design. Panel Built generator enclosures meet UL 2200 generator enclosure standards and Sub Base Tanks that comply with UL Standards 142 & 2085. If you have any questions about our Power Products Division, just give us a call at 800.636.3873 or send us an email at info@panelbuilt.com. As the modular building experts, we have the product expertise and know-how to provide you with the structure that will best fit your needs (and budget). If you have any additional questions about our structures, feel free to talk to us on our LiveChat in the bottom right!